For nearly two years, between mid-2012 and mid-2014, the euro appreciated against the world’s major currencies. Having reached a level of USD 1.39 in May 2014, the euro had increased in value since July 2012 by more than 12% against the dollar. During the same period, the euro appreciated by 44% against the yen and more than 3% against the pound sterling. 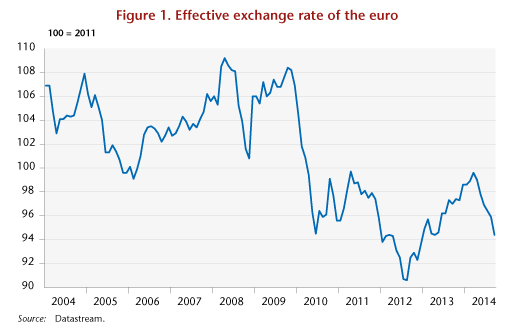 Since May 2014, this trend has reversed: after rising by nearly 10% between mid-2012 and mid-2014, the real effective exchange rate for the euro, which weights the different exchange rates based on the structure of euro zone trade, has depreciated by 5.2% over the last six months (Figure 1). In fact, within a few months, the euro has lost nearly 10% against the dollar, more than 3% against the yen and 4% against the British pound. The weakening against the pound sterling actually began in August 2013, and has reached over 9% today. We expect the euro to continue to depreciate up to the beginning of 2015, with the single currency’s exchange rate falling to 1.20 dollars in the second quarter of 2015. For many business people and economics experts, this decline in the euro represents an opportunity to escape the deflation trap currently threatening the euro zone. Faced with sluggish growth in the zone and an inflation rate that is falling dangerously low, the announcement by the European Central Bank of a quantitative easing programme indicates its willingness to devalue the euro against other currencies in order to support Europe’s growth and meet its inflation target. The French government also expects a great deal from the euro’s depreciation. The Treasury Department believes that a 10% decrease in the effective exchange rate of the euro (against all currencies) would increase our GDP in the first year by 0.6 percentage point, creating 30,000 jobs, reducing the public deficit by 0.2 GDP point and pushing up consumer prices by 0.5%. The revival of short-term growth in the euro zone through a depreciation of the euro’s effective exchange rate would also limit the non-cooperative policy of competitive disinflation being implemented in southern Europe (Greece, Spain, Portugal). While European countries trade mostly with each other and compete sharply for export markets, the effort to improve competitiveness through a disinflation policy is bound to fail in the euro zone if all the members adopt the same strategy. This is, however, the strategy chosen by the European Commission, i.e. by pushing the countries in crisis to reform their labour markets and cut labour costs. In this light, the depreciation of the euro is needed to support structural reform in Europe and support demand  even as fiscal austerity policies are further undermining it. In a recent study, we attempted to assess the effects expected from the depreciation of the euro. We are interested not in the reasons for the variations in the euro (differential performance, behaviour of central banks) but in its macroeconomic implications (in particular its impact on GDP, prices and employment). To assess the sensitivity of exports to price competitiveness for six major OECD countries (France, Germany, Italy, Spain, United States, United Kingdom), we made estimates using new foreign trade equations that distinguish, within the euro zone, intra-zone trade and extra-zone trade. The elasticities obtained are consistent with the existing literature on this subject. It is necessary to make a joint estimation of the equations for export volumes and import prices: this provides a feedback loop in partial equilibrium for a change in the effective exchange rate on import volumes and export volumes. Taking into account the marginal behaviour of importers and exporters tends to limit the effect of a change in the effective exchange rate on the volumes of imports and exports when these have little market power. 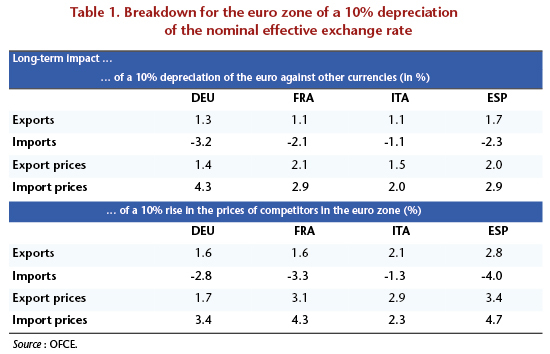 Simulations show that, in the euro zone, Spain would have the most to gain from a depreciation in the euro’s exchange rate against other currencies, but also from a policy of competitive disinflation (case where Spain’s export prices grow more slowly than the export prices of its euro zone rivals) (Table 1). For the French economy, we also carried out a more detailed analysis using the OFCE’s macroeconomic model emod.fr, with the goal of comparing our results with those obtained by the French DG Treasury with the Mésange model. Our results show that a 10% depreciation of the euro against all currencies leads to a gain in price competitiveness for export to France vis-à-vis the rest of the world. The other euro zone countries experience the same gain in competitiveness across all export markets. In this case, the effect on activity would be +0.2% the first year, and +0.5% after three years. Excluding the effect due to the change in price competitiveness, the increased demand resulting from the pick-up in activity among our European partners would be broadly offset by lower demand addressed to France from the rest of the world. On the labour market, the depreciation would create 20,000 jobs in the first year, and 77,000 jobs after three years. The public deficit would improve by 0.3 GDP point in three years (Table 2). Finally, we simulated the effect of a 10% increase in the prices of our competitors in the euro zone on the whole of France’s export markets. This 10% improvement in price competitiveness vis-à-vis the other euro zone countries would have a positive effect on activity via an increase in exports, investment and employment (Table 3). The impact on activity would be +0.4% in the first year and +0.9% after three years. It would be zero after 10 years. Nearly 130,000 jobs would be created in a period of 3 years and the government deficit would improve by 0.5 GDP point over this period. See C. Blot and F. Labondance, “Why a negative interest rate?”, Blog de l’OFCE, 23 June 2014. See the speech by Prime Minister F. Hollande on 5 February 2013 to the European Parliament. Economic and Social Report of France’s 2014 draft budget bill. See the speech by M. Draghi “Unemployment in the euro area”, Jackson Hole, 22 August 2014.